The article discussed below is behind a paywall. If anyone would like to receive a full copy, please email me: info at drattai dot com and I will be happy to share. The National Coalition for Cancer Survivorship (founded by a physician who was treated for cancer), the National Cancer Institute, and the American Cancer Society consider someone to be a cancer survivor from the time of diagnosis until death. Of course, one size never fits all, and many patients do not consider themselves to be cancer survivors for various reasons. Patients are aware that cancer can recur even many years after treatment. Those with metastatic disease are aware that they will likely die due to the cancer. Some find the term survivor as well as any attempt at “labeling” to be offensive, not wanting to be defined by their cancer. However, some patients and their families do identify by the term, proud of the fact that they indeed survived the ordeal of cancer treatment. In order to gain an understanding as to how patients treated for cancer prefer to be identified, researchers tapped into a large online patient community focused on breast cancer research, the Army of Women. The authors received approximately 1400 responses to their survey. Those who were undergoing treatment were less likely to identify with the term cancer survivor compared to those who had completed therapy. Those with metastatic disease and older patients also felt less positive about the term. 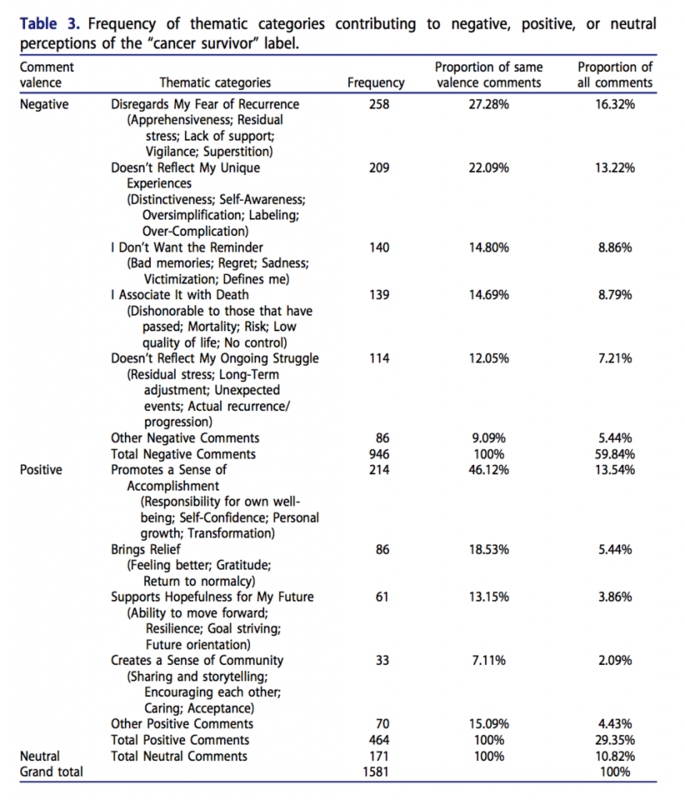 Open-ended questions noted approximately 60% negative, 30% positive and 10% neutral sentiment regarding the phrase “cancer survivor” (2 tables from the study are attached below). 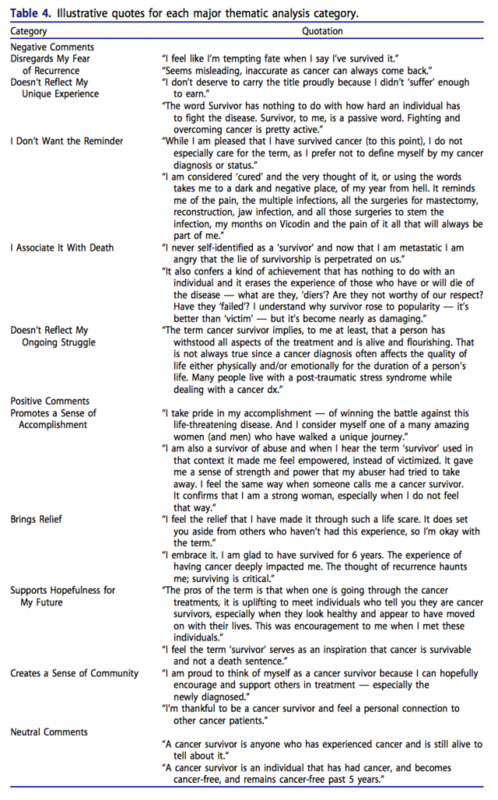 Full Article: Is it time to reconsider the term “cancer survivor”?